David Legrand at Fraser Yachts in Monaco tells me that the owner of the 25.95m motor yacht Beleza of London is now a very keen seller and has authorised a price reduction. Beleza of London is a "pocket" expedition yacht built by Inace in 1999. Her low consumption twin Caterpillar 3406 engines and fuel capacity of 9,400 US gallons are ideal for long range cruises. This superyacht is built in steel and aluminium, Germanischer Lloyd classed and MCA compliant and can accommodate 6 guests in 3 staterooms. Refitted and slightly lengthened in 2009, her stern now offers a comfortable sunbathing platform. 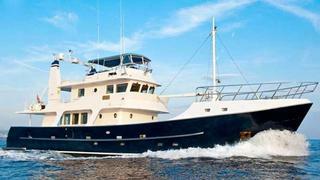 Formerly asking €1.75 million, she's now priced at €1.69 million.